G+4 Residential & Commercial Complex. Clear Titile CIDCO Transfer Plot. Every individual has a wish to live Splendor life in the Mumbai City. But you can have a special lifestyle in our very own Navi Mumbai City. So you want to check with your upcoming life then ‘Navi Mumbai Houses’ grandly welcomes to the style of Elite Grandeur, a "Leaf Villa" is a G + 4 storey pure residential project consisiting of meticulously designed 1 BHK Flats & shop with exhilarating life style. We at '' Leaf Villa '' have built a dream home in the midst of commercial hub surround by all day conveniences. You could say the very best of budgeted flats ranging from 1 BHK Flats in one single building. Road access from Uran, Sion - Panvel Express & Mumbai - Pune Expressway and NH 4, And also 5 min. Drive from Proposed Dronagiri Railway Station. Leaf Villa is one of the popular residential projects of Shree Khodiyar Builders & Developers which is located in Sector 48, Dronagiri Navi Mumbai. 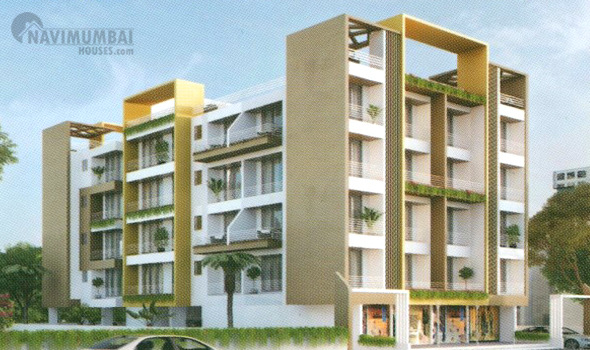 This project offers 3BHK apartments with basic amenities that are required for a comfortable stay of residents. Leaf Villa is a perfect amalgamation of nature’s beauty and high-end features as it is surrounded by plush greenery that provides a soothing view for the residents. Navi Mumbai Houses a well known agency which aims to deliver the best lifestyle with great status. Railway : Seawoods - Uran line & Panvel - Uran line, Work in Full Swing.